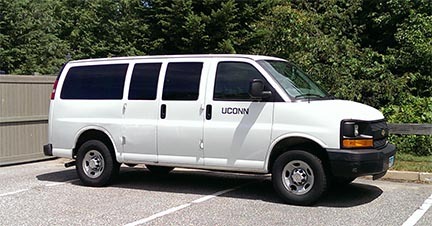 UConn Department of Student Activities (DSA) offers Vehicle Rental Services through the area of Community Outreach Programs, Services, and Initiatives. 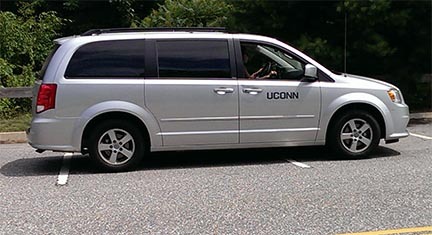 Our fleet consists of 6, 11, and 14 passenger vehicles. 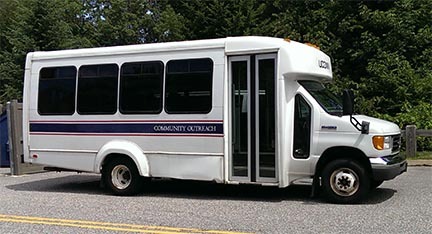 Handicapped accessible vehicles are also available. Rental services are available to University departments and student organizations that follow the mission of Community Outreach. Guidelines for eligibility to rent these vehicles are outlined below. Scheduling priority will be given to the Department of Student Activities areas and Student Organization requests. Consideration will then be given to requests from other departments that emphasize academic service learning and service based activities based upon availability of drivers and vehicles. Events are drug and alcohol free. Travel purpose is for academic service learning or service based initiative. These requests will be reviewed for consideration based on availability. Requests must be submitted 2-3 weeks prior to needing a vehicle. Rental requests will no longer be considered for other activities. Community Outreach retains the right to deny use of a vehicle if in its sole opinion safe vehicle operation cannot be ensured due to weather/road conditions or there has been a past failure of the organization/renter to follow Community Outreach policies or procedures. For additional questions on the rental policies and procedures please contact Brian Chebro; Coordinator of Transportation services for Community Outreach. Brian can be reached at brian.chebro@uconn.edu or 486-1165. * Requires a Community Outreach driver or equivalent. ** Current state mileage rate (subject to change).